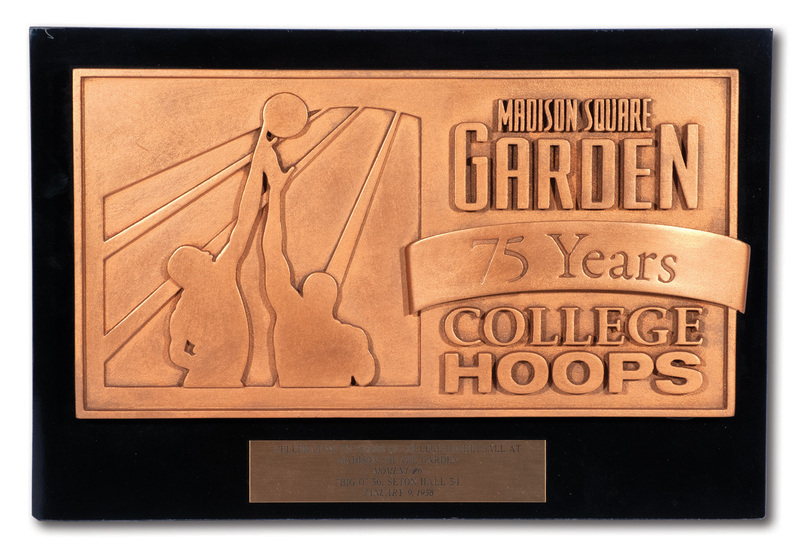 To celebrate the 75th anniversary of hosting college basketball, New York’s Madison Square Garden selected a Top 10 Greatest Moments that occurred beneath its roof. Moment number six was Oscar Robertson’s incredible 56-point game against Seton Hall. Robertson’s January 9, 1958 achievement was so phenomenal that his 56 points alone outscored the entire Seton Hall team. 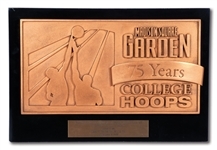 Madison Square Garden presented Robertson with this 10” by 14.75” robust bronze/copper plaque. The piece weighs 7 lbs. and is propped up with two 4" pillars in the back for easy display. It shows light wear and displays beautifully. A magnificent tribute to one great moment in The Big O’s long, extraordinary career. Includes LOA from Oscar Robertson.